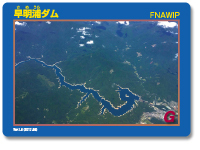 [Japan Water Agency / JWA] Water resources development of seven river systems. Three towns and one village - Otoyo Town, Motoyama Town, Tosa Town, Okawa Village in the upper reaches of the Yoshino River in northern Kochi prefecture called "Reihoku area". The area is surrounded by mountains in a peaceful atmosphere. 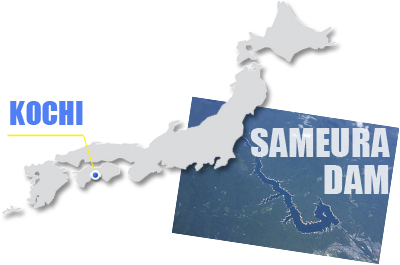 To introduce it more to people, the second car trip of the Reihoku- ji route to leading you to Sameura Dam - "life of Shikoku" has been planned. 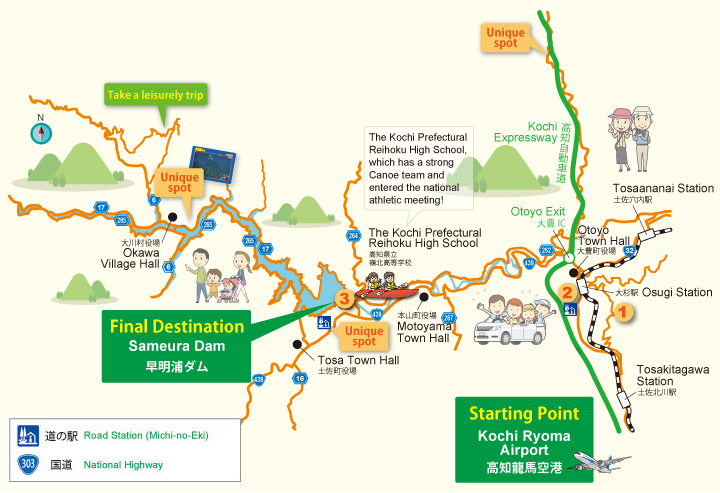 The gateway to Kochi Prefecture, which is known as the hometown of Ryoma Sakamoto who had a great influence on the beginnings of modern Japan, has been made easier to access from Kochi Ryoma Airport Interchange on the Kochi Nankoku road after the opening of the Nankoku Minami Interchange. Rent a car, and off you go! Approx. 40 min. from Kochi Ryoma Airport to the Otoyo Interchange through the Kochi Expressway. And approx. 20 min. from the Otoyo Interchange. This park is located at an altitude of 750m, giving us the view of the entire Sameura Dam from a distance. Camp sites and an athletic field facility are available. A special Sameura Dam Curry using flesh of wild game such as venison, or wild boar meat (or without it) is also available. It is very popular among various visitors regardless of age. 4037-25 Nakamuradaiou, Otoyo Town, Nagaoka-Gun, Kochi Pref. Japan's biggest cedar tree, "The Great Cedar Tree" is estimated to be around 3,000 years old. The tree has been designated as the country's special natural treasure. There is a monument for a deceased singer of the Showa period, the great Misora Hibari. She once visited the tree and prayed to be the greatest singer in Japan. At the entrance of the Great Cedar, there is a resting area on the roadside, called "Osugi Michi no Eki". Here you can enjoy Tachikawa soba with its soft, glutinous texture with a bit of sweetness. 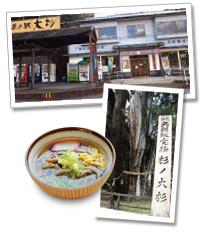 Goishi tea is also a famous local specialty there. It contains a lot of lactic acid bacteria, which is said to be effective for influenza prevention. "Goishi Udon noodles", in which Goishi tea is mixed is also recommended to try. 743-1 Sugi, Otoyo Town, Nagaoka-Gun, Kochi Pref. ¥200 for "The Great Cedar Tree"
Sameura Dam is located in Yoshino River and its water storage capacity is the largest in Shikoku region. Sameura Dam supplies water to four prefectures in the region. 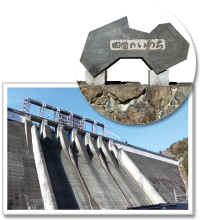 The word "the life of Shikoku" is engraved on the stone monument as part of the dam site. It's true, a dragon was in Shikoku! A card illustrated with photos became a topic of social media or on SNS as the silhouette of the dam looked like a dragon from bird eye view. The card is available at Mura Station in Okawa Village. The photos presented by Kaminari-mon Shikago. 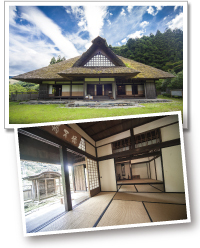 The Tachikawa Bansho Shoin guard house which was used as a lodging house of Tosa lord at the time of Sankin-kotai (Samurai on duty visiting Edo and switching positions with commuters), has been designated as important national cultural property. The bed for the lord is positioned one step higher, demonstrating the time of Samurai. Try touching on such history. 28 Tachikawashimona(Kariya), Otoyo Town, Nagaoka-Gun, Kochi Pref. Exterior observation is allowed all day long. [Unique spot]Michi no Eki (Roadside station)* "Tosa Sameura"
This specialty shop carries a lot of local products such as "Keigetsu" Sake (Japanese rice wine) which has been blessed with the soft water of the area. 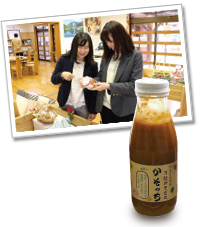 The store also has many other unique products only available in this area such as slightly sweet Miso. 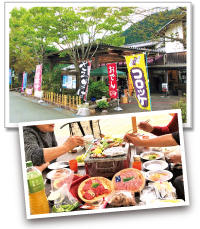 The special croquette made by the restaurant Yosaku attracts tourists as well. You can also enjoy a barbecue of Akashi beef in the area by renting the BBQ gear, on the Wood Terrace of Michinoeki in Higashi Kouen Park (Reservation required). 448-2 Tai, Tosa Town, Tosa-Gun, Kochi Pref. Garlic and ginger based miso sauce "Kasocchi" is an ingredient that you can only get there. Originally it was a sauce of skewered food. But it was found to also well with Yaki Udon (fried wheat noodles). Other foods such as Hachikin brand chicken produced in Okawa Village, Tama green tea, Ponzu (juice pressed from a bitter orange), Karinto (fried dough cookies) and more are available. In addition, Ohkawa Ramen and Crème Brulee as snack are available on weekends or on holidays. 239 Funado, Ohkawa Village, Tosa-Gun, Kochi Pref. [Meals] 11:30-15:30 on weekends or on holidays. 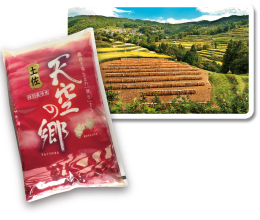 Brought up in beautiful rice terrace water and good quality soil, "Nikomaru" is the only brand of rice which has won the nation's best rice award twice. This rice is sold in major department stores in Tokyo and is loved by people inside and outside the prefecture. Its rich sweetness and reasonably chewy texture fits well with any bland side dishes. Shirataki no Sato has an accommodation facility that opened after renovating abandoned Shirataki elementary and junior high schools which were in the dead copper mine called Shirataki Mine. A blackboard at school is displayed in the guest room, reminding us of our childhood. 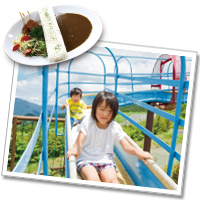 You can experience making Konnyaku (jelly made from devil's-tongue starch), Tofu (bean curd) , and other foodstuffs. Among them, making Konnyaku is the most popular among tourists. Local people act as lecturers to teach us how to make them in a traditional manner. 26 Asatani, Okawa Village, Tosa-Gun, Kochi Pref. 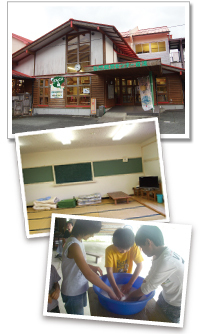 ¥3,675/night without a meal, other plans with meals available. ※All the contents of this brochure are based on the information available at the time of interview and data collection and they may change later. Copyright© Japan Water Agency All Rights Reserved.